There is something very comforting about a keto baked custard, and as it is a combination of cream and eggs it is a great keto-friendly dessert option. 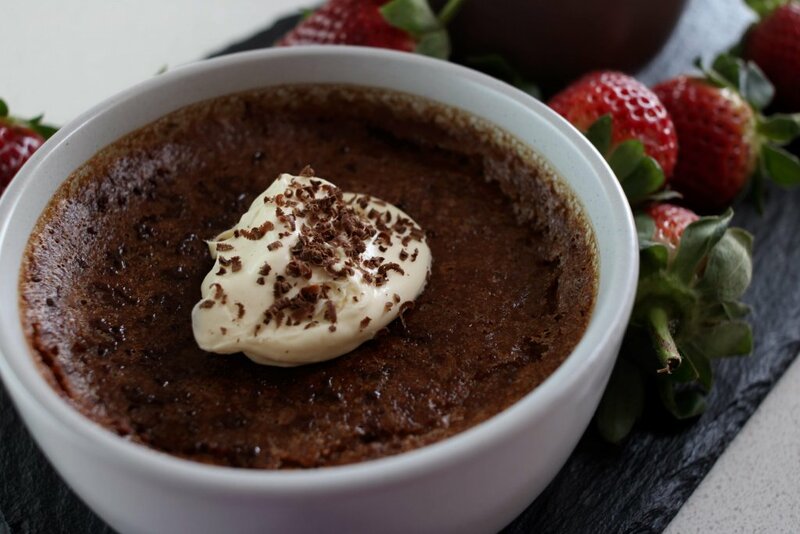 We love the flavour combination of chocolate and orange in our keto baked custard, I mean who doesn’t love chocolate? One of the first recipes on our blog was our vanilla custard, which shows our true love of all things custard, and it is still one of our most popular recipes. 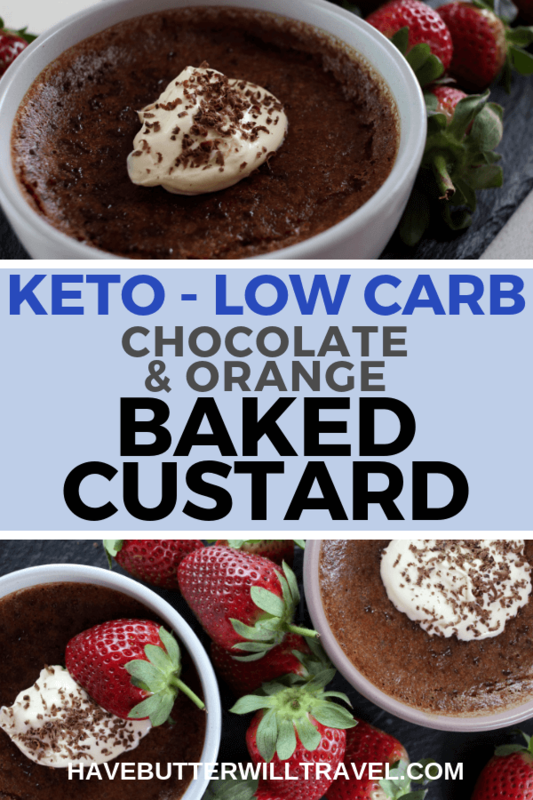 Chocolate and orange are a perfect flavour combination and it works well in this delicious keto baked custard. This is the type of dessert we would serve when we have friends over for dinner. 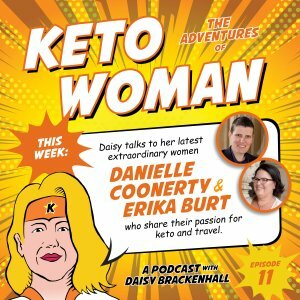 We love trying out our keto creations on our non keto friends. I am sure they love being our taste-testers as well. 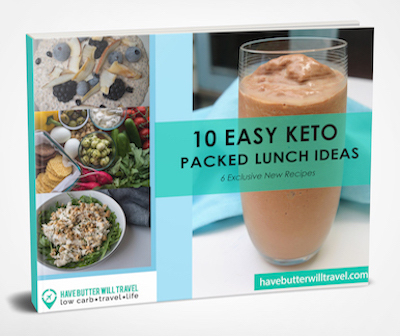 It’s important for us to be able to serve keto meals and desserts to our family and friends, so we can still have our friends over and enjoy a meal with them. 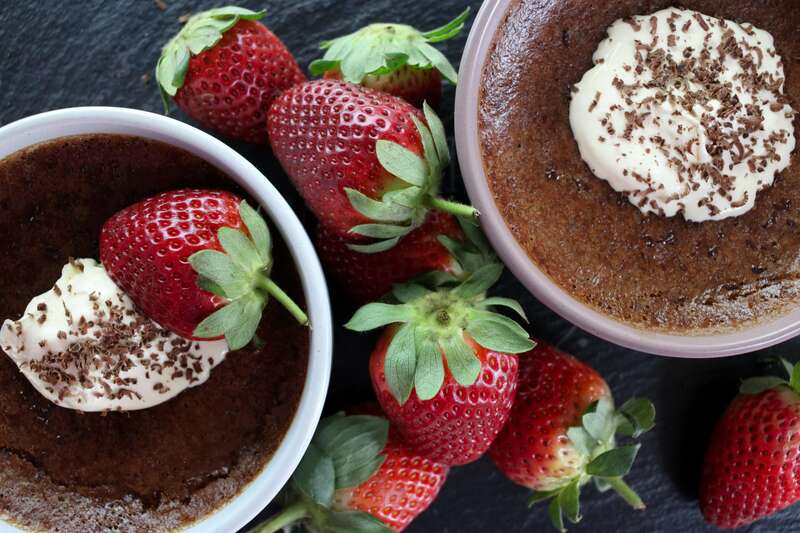 This baked keto custard has now been added to the list of foods our non keto family and friends love too. I’m not sure if jaffas are just an Australian thing, but they are chocolate orange balls with a coating similar to an m&m. 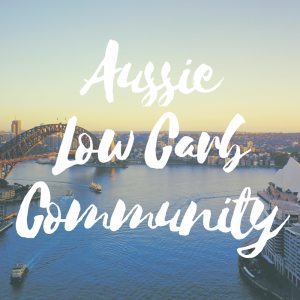 They are very popular in Australia and are an iconic part of going to the movies. Most Australian kids in the 70’s and 80’s would have rolled jaffas down a movie isle at some point in their lives. This keto baked custard reminds me of a jaffa. One of my favourite pastries is a Portuguese tart. I also used to love a custard tart as a kid. Well, I am not eating tarts any more, but baked custard is an excellent replacement. I still get to enjoy that delicious baked custard taste and texture that you get in the tarts without the carby pastry part. Just sit down with a spoon and enjoy. We’ve eaten this warm, at room temperature and out of the fridge the next day and would say we preferred it cold out of the fridge or at room temperature. 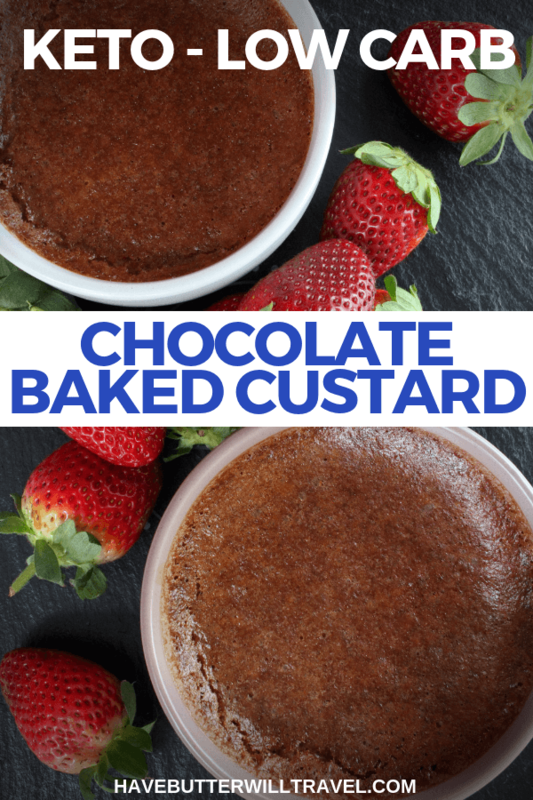 We love to use Sukrin sweeteners in our keto baking and this baked custard. We have tried loads of the sweeteners available on the market and have found this to be the best tasting option with no bitter after taste. Our family and friends, who are not keto, love our keto baking too when it is made with Sukrin. Also, it is made with our preferred sweeteners, a combination of stevia glycosides and erythritol. Love Custard? You need to try this delicious keto baked custard. It combines chocolate and orange flavours for a easy dessert, everyone will love. Place baking dish in oven and bake custards for 30-40 minutes. They will still have some jiggle to them, but will no longer be a liquid consistency. The timing may vary depending on how deep and what shape your ramekin is. I like xylitol for sweetener. I ordered Sweve online and really didnt enjoy it. How do the Sukrin sweeteners compare to Swerve? 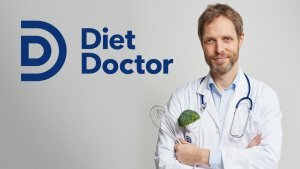 And could xylitol be used for this recipe? Thank you. We haven’t tried swerve, but we are pretty sure it’s the same ingredients as Sukrin. Xylitol will work, but you may need to test for sweetness as I don’t think its as sweet as Sukrin. Let us know how it goes. Do you think Almond Milk would work instead of Macadamia Milk as I have never seen that for sale in the UK? Thank you for this delicious recipe. Mixing it all in the blender, and no separating of eggs, nice and easy. I substituted unsweetened Silk Cashew/almond milk for the macadamia, and Lakanto Monkfruit for the sweetener, which, like Sukrin, does not have the weird cooling aftertaste that others do for me. I baked a double batch for 45 minutes and they are perfect! So glad you enjoyed it Shirley! Yes, I loved how easy it was to make as well, always a big plus.